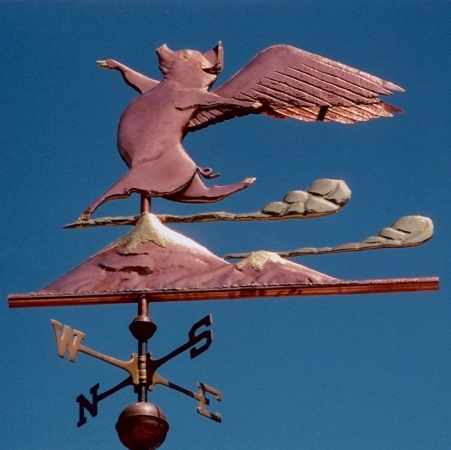 This whimsical flying pig Weathervane was commissioned by a couple who loved the concept of achieving what no one feels is possible, and knew from experience that they had. They requested we seal in ‘Lucky Pennies’ for significant dates of their accomplishments in addition to the always present penny from the year of their vanes creation. They chose optional gold leafing for the eyelashes, eyebrows, snout and hooves, and the snow capped mountain tops. The clouds are brass (as are the North, South, East West directionals) and the remainder of the sculpture piece is fabricated in copper in the swell bodied style. 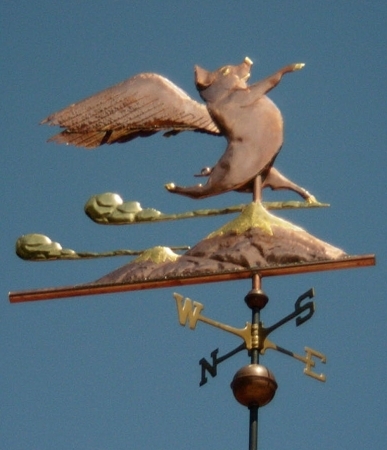 Our Joyful Pig Weathervane is a variation we did for a customer who had first hand experience of the pleasure a pig can exhibit. The inspiration for our delighted pig designs came from a photo I saw in an old National Geographic magazine showing two kids sitting on a fence rail in the hot summer of the Australian Outback hosing down their pet pig with cool water. The pig had the most blissful look on its face of any creature I’ve ever seen. Individually made, hand hammered, farm animal weather vanes are highly collectible, and we expect this one to be among the most prized as it develops the prized natural weathering and patina. 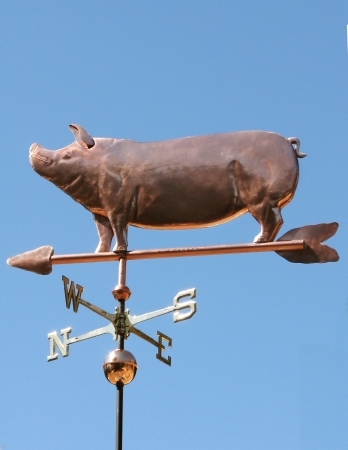 As with all our Weathervane designs, we can customize your vane to reflect your own interests. One customer requested we add a sunflower to our joyful pig design. It too is a lovely piece. There is no clear reference to when the phrase ‘When Pigs Fly’ (which, by the way, is an adynaton) became synonymous with the impossible, but the first reference we found was of the great author of American literature John Steinbeck. When in college he was told by a professor that he would be an author when pigs flew. Hence, every book he published began with the insignia ‘Ad astra per alas porci’ (to the stars on the wings of a pig).